TheEssentialGarden | It's very, very easy to eat really, really well. It's very, very easy to eat really, really well. Can I Commit to Eating Regionally? As California’s historic drought continues and thousands of acres of farmland are laying fallow, I began to wonder what it would really be like to eat only what grows regionally… eating only what I would drive to purchase if I were buying it direct from the grower. Eating seasonally is on most peoples’ radar now, thanks to the decades since, say, Chez Panisse changed restaurants’ relationships with local farmers in 1971. 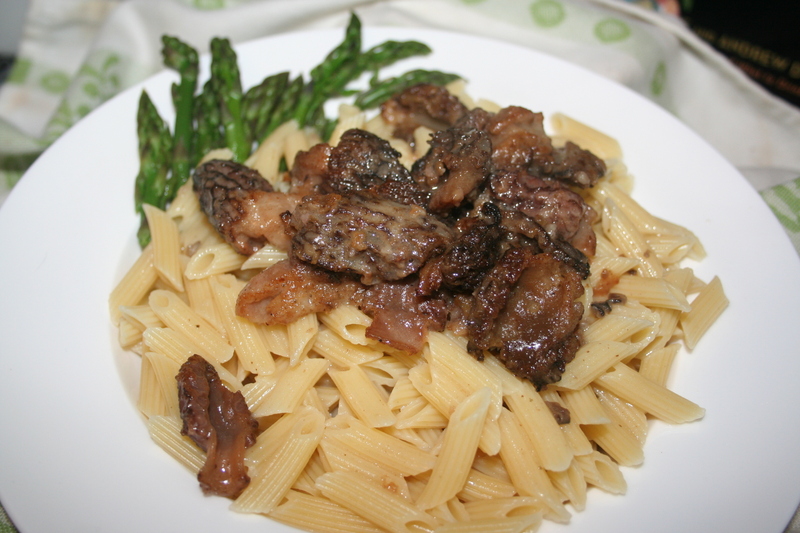 Portland Farmers Market at PSU was a in full swing on Sat, and I purchased about 1/3# of fabulous morels at $28/# because I knew I could use them immediately. 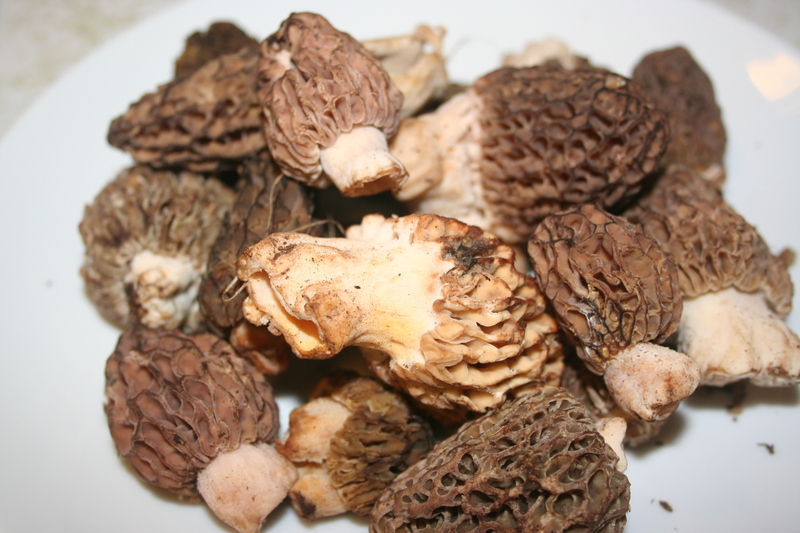 Mushroom hunters often follow morel sites throughout the state, and these likely came from southern Oregon. Through Jul when their availability ends, they could be picked in other geo-areas throughout Oregon. A very minor food miles impact. Give some thought to what actually grows in your geographical area seasonally. If I chose to eat only Northwest regionally-grown food, what would I have to eliminate? Tree fruits, like citrus, almonds, walnuts, pecans and apricots grow beautifully in California, but are weak or not recommended in areas of Oregon other than the coastal region which has a longer, hotter growing season. Seafood, aplenty. If I lived in the Midwest, I’d have summer heirloom tomatoes, sweet corn and beans that have no equal in flavor, though they’re grown in many other areas of the country. Blueberries and cherries do grow in the Midwest; however, the best-closest are in Michigan and Pennsylvania… mushrooms, too. Citrus certainly doesn’t grow that far north. Seafood? Food miles. Taken one giant step farther, what about olives, olive oil, dates, figs, Romano and Parmigiano Reggiano cheeses? Air miles. Today, pinot noir grapes thrive in the Willamette Valley in Oregon. Twenty years from now the forecast is that a then-warmer region will be ideal for now-California chardonnay. With big changes in water availability and fundamental shifts in what can be grown in a given region, the conversation is relevant. Thinking through the idea of eating regionally is worth spending a few minutes on. What changes am I willing to make before change is imposed upon me? What is Your Axis Tethered To? Ever felt like your axis was tethered to the tail of a kite? Are you aware that you have an axis? Or a tether? You have both… we all do… but the vast majority of us go through life feeling around our axis or trying to avoid being aware of it it altogether. Recognizing one’s own axis and having a willingness to ride the waves of change that attach to life’s upheavals, say in career change, is courageous… a kind of courage I have deep respect for. Karen Cianciolo, health coach and principal in KTC Wellness, and I shared corporate employment many years ago. Karen’s personal life over these many years since, exemplified in commitments to excellence in food and fitness, now has a permanent professional face that benefits others. Karen’s decision to counsel others into the individual choices that benefit their health and wellness are a natural extension of who she is. This is a life lived authentically for the benefit of others. Who do you know who could benefit from wellness counseling? Small changes yield big results that manifest in transformed lives. Only little bits of courage are required. One needn’t feel tethered to the tail of a kite to realize significant change in wellness. Ask Karen. Have you discovered your axis? What are you willing to do with it to benefit others? The Essential Garden blog is veering around a new corner. Almost four years after its inception and going forward, the blog’s focus will be a bit more topical; posts will be succinct, somewhat less conversational and, hopefully, distilled into the essence of the topic. Opinion inserted in the posts will be placed to engender thought, conversation and, sometimes, action. Dedicating myself to a Baking & Pastry Management degree at the Oregon Culinary Institute drove the creation of the On Pleasureful Pastry blog a few months ago. The OPP blog is more the journey of a novice pastry cook into the sophisticated word of pastry art, stumbles and successes all. Humility, humor and self-effacing commentary are the spokes of the OPP pastry wheel, flourished with a new love for poetry. So, welcome to what has always been present. Promise kept. The Environmental Working Group has created a valuable food product resource called Food Scores: Rate Your Plate. It’s a comprehensive website that rates products by label and type and compares them to others of its category with a numerical rating between 1-10. The ratings are reflective of EWG’s evaluation of nutrition, ingredients and processing. It’s simple, graphic and easy to use. I’m happy to have it as a resource. Check it out and spread the word. The book has 700+ recipes, no photos, is 1054 pages and is intended as a primer to increase the efficiency (and the pleasure) of the home cook’s time in the kitchen. Mark used an analogy of the principle of a pen and ink drawing… that one shrinks the world so he or she can understand it by laying down a line of permanent ink that cannot be altered but must tell a story. Small contours in a drawing suggest texture. Information is implied, not overtly stated. Room for the mind to wander. 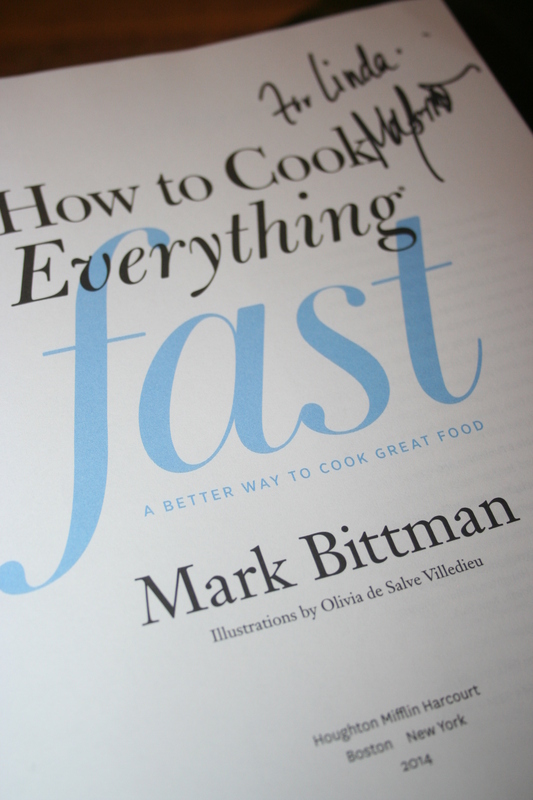 The pen and ink analogy parallels the simplistic and efficient quality of “Fast.” It’s a way of finding out what your relationship with food is. Poached Chicken and Asparagus with Lemon Aioli is an example of how cooking time is easily reduced by shared cooking. Put the chicken, 2 C water and 3 sprigs thyme in a large pot over high heat. When the liquid boils, lower the heat so it bubbles steadily but not vigorously and turn the chicken. Cover and cook until the chicken is opaque and just cooked through, 12 to 15 min. Trim the asparagus. About 7 min after you covered the chicken, add the asparagus and re-cover the pot: By the time the chicken is cooked through, the asparagus will be tender bur still have a little crunch, 5 to 8 min. [Another option here is to poach the chicken per instructions for 8-9 minutes, then add the trimmed asparagus in a steamer on top of chicken in the pan for 5-6 minutes depending upon the size.] If one finishes before the other remove it first. Peel and mince 1 garlic clove; add it to a small bowl. Halve the lemon; squeeze the juice into the bowl. Add 1/2 C mayonnaise and a sprinkle of salt and pepper to the bowl; stir to combine. [Alternatively, it’s easy to make homemade mayonnaise: combine 1 egg yolk and 2 tsp Dijon mustard in a mini food processor or blender. With the machine running, add 1 C vegetable or canola oil in a slow, steady stream to form an emulsion. Season with chopped fresh thyme, salt, pepper and 1 Tbsp lemon juice. 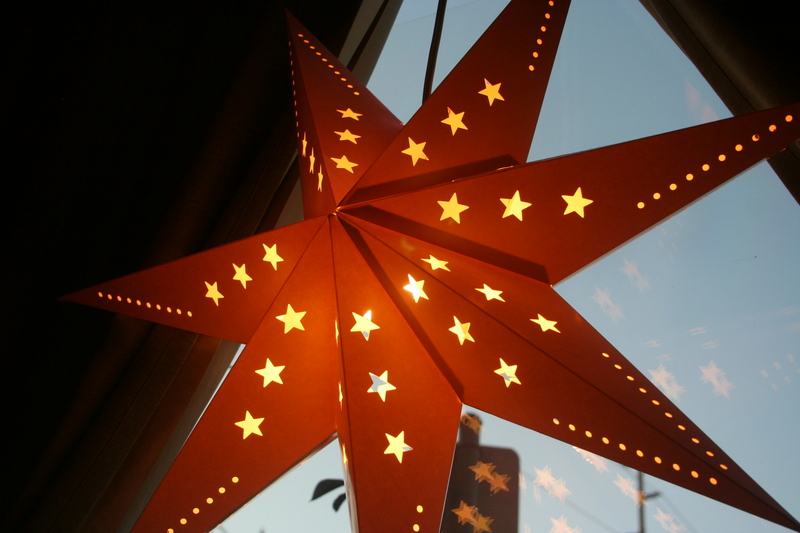 Stars cross when elegant, handmade pasta dishes arise out of thoughtful, committed product sourcing. Such a galaxy exists under the name of Iorio in Portland’s SE. Attention must be paid to the model of simple, home-style quality that is Iorio’s hallmark. Chicken is sourced from Draper Valley Farms; pork is sourced from Carlton Farms. Both are well-known in the Portland food community as organizations dedicated to humanely raised and sustainably farmed animal production. Indeed. 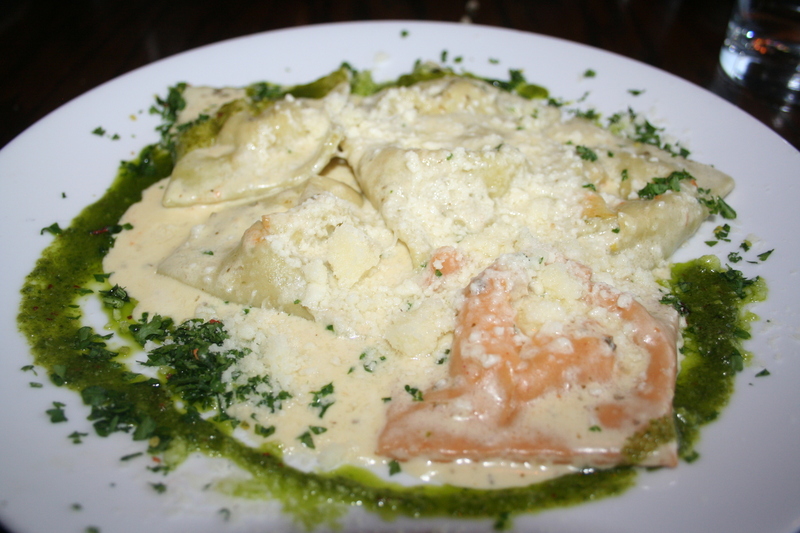 Fresh, handmade ravioli with braised chicken, mozzarella, ricotta and pesto with a basil cream sauce, sheep’s milk pecorino and holy oil. Deeply flavored; immensely satisfying. 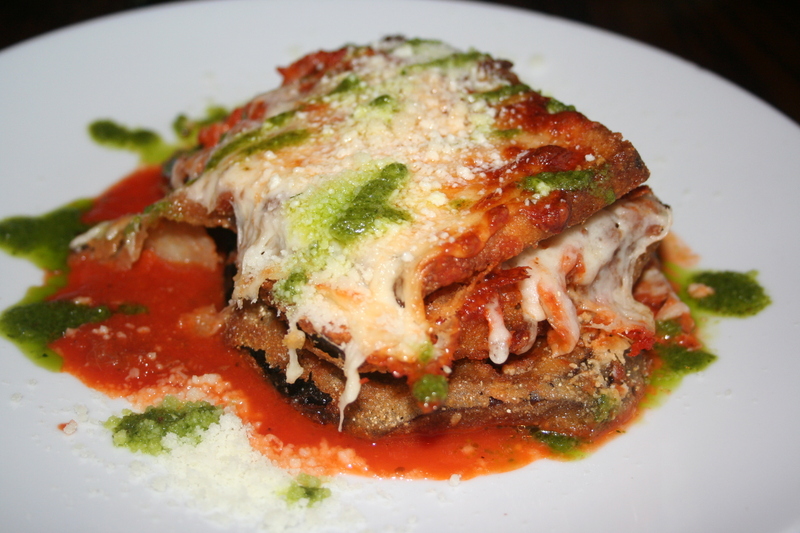 Her favorite Italian restaurant, my friend’s favorite Iorio dish is the Eggplant Parmesan. Beautiful layers of eggplant roasted in the traditional style of the dish, drizzled with pesto. Succulent. Chef Chris Thompson does very well that which engenders his guests’ accolades and loyalty. He pairs the best Italian food with his own presence at the guest’s table, making the entire experience memorable. Iorio’s original trajectory to “teach cooking in-house” is alive and well today. They offer classes with Chef Chris for private parties or special occasion groups. Stars are crossing on SE Hawthorne. GMO food products are not regulated by the Food and Drug Administration (FDA). They are seen by the government, not as foodstuffs, but as pesticides, and are regulated by the Environmental Protection Agency (EPA). In its simplest form, GMO plants are altered at the cellular level to protect themselves against insects and pesticides. In the case of Monsanto’s NewLeaf potato, a gene signals the production of a toxin lethal to the Colorado potato beetle. Industrial farming operations are largely monocultures; that is, the crops these operations farm are singular… corn, wheat, soybeans, cotton… the result of demand by food corporations for product that can be turned into familiar fast food products. If we’ve eaten McDonald’s fries (made largely from the Russet Burbank potato) in the past 10-15 years the likelihood is that we’ve eaten GMO potatoes. I wonder how many of us would elect to eat GMO foodstuffs, if we knew we were eating them. There is no current labeling requirement for genetically modified food. What’s more concerning is that the regulation of GMO foods is voluntary; that is, it’s at the election of the owner of the GMO patent (e.g. Monsanto) whether to shed light on a potential safety concern. Corporations self-policing. The genetically modified organism is the most critical topic in the American food system conversation. The old adage of “We are what we eat” is given new and urgent importance.